Our final morning on the KCHBR and in the Sierra. We soaked it up these last couple days knowing how fortunate we were to be able to do this trip and pull it off. Many factors have to come together to make a route such as this work. We both are grateful the chips fell into place with no fire closures, excellent weather (not a drop of rain in 12 days! ), great trail conditions (we went a bit early), and no injuries. This morning was a brief mile of off trail from Grouse Lake to get us to the Copper Creek Trail and then 6.7mi down to the car at Roads End, 5,434ft below where our tents were pitched this morning, whew! Sunrise coming through on the Copper Creek Trail. For me, I’ll be coming full circle this morning, and I love that. About two months ago, I started this summer of high routes, as a somewhat apprehensive novice, at the exact same trailhead. 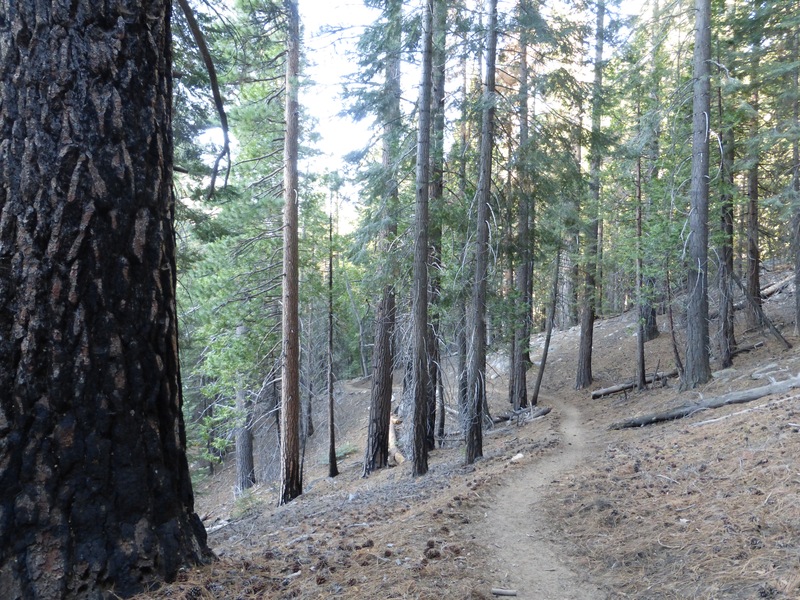 Heading up the exact same trail for the Sierra High Route. I was such a different hiker then and never imagined I’d take to this type of hiking and enjoy it as much as I do. Morning light as we thankfully were shaded on the way down. I know this summer has been quite different from my previous hikes and that long trails with a trail community makes for, often times, more entertaining reading than just describing one pass after another. No worries, the next 6 months or more will surely be filled with that type of journal entry as I will be headed to actual TRAILS! This was a really good experience for me. I like challenges and pushing my comfort zone a bit to grow and evolve. This summer was definitely a challenge to learn map and compass navigation and to feel comfortable on off trail terrain. Specifically, to feel comfortable on rocks, which has always been a fear for me given my weak ankle that likes to give at any moment. Somewhere around the second or third week of all this, I finally started to feel more natural and less hesitant on the rocks. Now I can cruise on them and step confidently in stride from one boulder to another, whereas I previously would use my hiking poles or hands as a precautionary brace anticipating a slip or fall. Somehow after two months of this, I didn’t have a major fall on the rocks. Some bumps and bruises, but nothing major at all, and that was a huge confidence boost for me and my faith in the ankle I step on. I no longer have that slight wave of anxiety with a leap from one curved rock to another anticipating my ankle to give. I learned to step in a direction that it will be less likely to roll and it became more natural over time. I can’t say that this type of travel is one I enjoy more over the comfort and ease of trail miles, but I can appreciate it. It opens up so many more opportunities for exploration and travel, and I’m excited about the possibilities that could bring. For many people who read this blog, I know that this type of hiking can be difficult to fully relate to and understand as far as how challenging and difficult it is. The line-up of the Sierra High Route, High Sierra Trail, Wind River High Route, and Kings Canyon High Basin Route is extremely ambitious with a ton of factors needing to fall into place. People don’t do this type of hiking, for this extended amount of time, at this level of intensity. I met someone on trail who was basing their SHR hike off my schedule and said they found they needed double the days to complete the route. I do want to stress that, for most people, the pace that we went this summer, would be considered aggressive. Please take that into account if you are planning to do any of these routes. If you are normally a trail hiker, I’d compare what we did to the energy it would take to hike 30+ mile days routinely. It was not a vacation by any means and was full days of hiking at an intense level. I enjoy that type of hiking and I know it isn’t for everyone over an extended period of time. These routes can be done at a more relaxed pace. Yes, it would require carrying more food or finding creative ways to resupply, but it can be done. KCHBR complete! Copper Creek Trailhead at Roads End. It all went so seamlessly as far as logistics, weather, and health that I feel so very fortunate. When those factors out of my control fall into place like that, I like to believe it’s because I’m where I’m supposed to be. There is a natural flow that just clicks and I definitely felt like I was in that groove this summer of everything just falling into place to make all this happen. I also was fortunate to have friends willing to endure such challenges as well. It is quite motivating to do routes like these in groups or pairs where you can have someone to share the difficult and amazing moments. I want to thank Why Not, Rockin’, and E for coming along and tolerating a schedule that was sometimes more tiring over an extended period of time than they would have preferred. As for the Kings Canyon High Basin Route, I have to applaud Skurka on piecing together a route that is well balanced in challenge and reward. We met many people out doing their own routes in the Sierra. It is a playground where really anything is possible and you can lay out a map and be creative. For those of us unwilling to put in the research or time, it is quite nice to have this and the SHR as options for high routes. None of this is new to anyone who travels in the Sierra. People do their own off trail routes all the time and many books detail every area and pass we’ve been through. It’s nice to have them all linked together to create a nice route for people like us looking to do a thru-hike of sorts (there are also loops and section hike options for the KCHBR and SHR). We only used the GPS twice the whole time (confirming King Col location and checking where to cross in Goddard), and that isn’t just our skills, but that means that the maps and descriptions were well done. So props to Skurka on making a guidebook and map set with more complete content than some of his other online packages. I know I gave him a hard time on his less than quality WRHR package, but I like to give credit, both good and bad, where it is due. Skurka redeemed himself on this one. Once the third version of the KCHBR packet is compiled, I would say that it is a solid guide for this trip. At the moment, the pieces are all there to be put together at least. Hopefully soon, he will compile it all in a more user friendly way so the updates are part of the original content and not a separate file of notes. Ok, back to today. We finished by 9am, headed just a few miles down the road for breakfast burritos and showers at Cedar Grove Village, and then began the day of driving. It was two hours to get back to my car at our start point at Lodgepole. Then we parted ways. E is always traveling somewhere and is looking to complete a small section of the PCT that was closed to her 11yrs ago when she did the PCT, then her home in Moab for awhile before the Antarctica ice core drilling season begins again. We may overlap and see each other again in New Zealand (she has a home there she tends to be at in our winter) and we both have dreams of Tasmania one day, which just might work out if I get time in our late spring after the TeAraroa…so, so fortunate to have E as a friend and hiking partner and I’m sure we have plenty of hiking ahead together! THANK YOU E!!! For me, I drove to visit family in Moraga, CA. My mom, stepdad, younger sister, and nephew, live there. I can’t believe I was sleeping in my tent at a beautiful lake over 10,000ft this morning and I finished the day in Moraga enjoying a steak at the Outback Steakhouse (great warm-up for Australia in less than a month!). Yep, that’s how to end a trail. Steak dinner to celebrate! 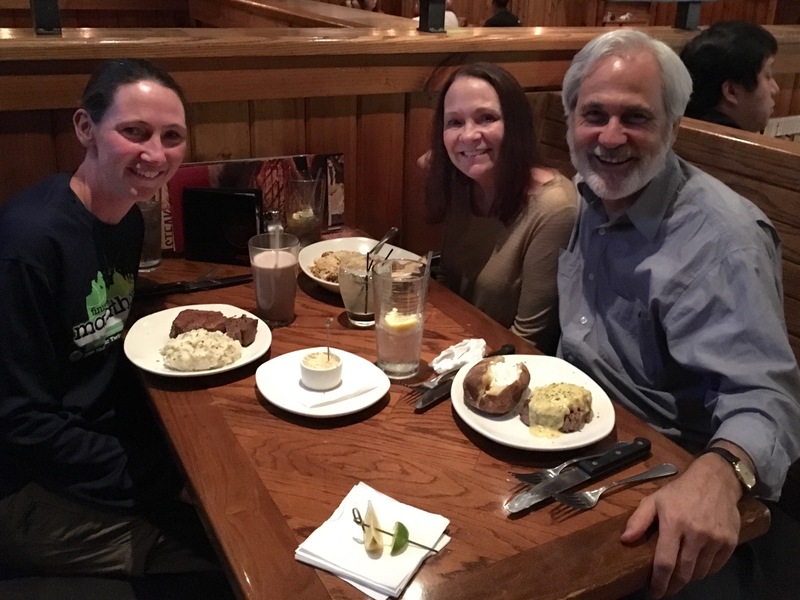 Outback Steakhouse celebratory dinner with my mom and stepdad. I will spend a few days visiting with family and then I head back home to Portland for a couple days to then transition to hopefully do the Wonderland Trail (~100mi around Mt Rainier ON TRAIL!) for a week next week. I’ll put up more on that in a few days before I leave. Thanks to everyone for hanging in there on these high routes. Trail is coming and I’m just as excited as you are to stretch my legs! Thanks for bringing me on your journeys through your incredible pictures and well-written blog. What an accomplishment to face your fears, gain experience and grow in your hiking capabilities. Erin, you are amazing. All the best to you as you continue to explore new vistas and grow mentally, physically and spiritually. Erin, Awesome job! I love reading your blog and look forward to your coming adventures. Happy trails!! Congratulations on completing yet another awesome hike AND taking us along too. I don’t know how you manage it, after such big days. I came home and did so and immediately saw a photo of Wired, Rockin and WhyNot on the High Sierra Route. Haha yes, Swami is a friend and he has been everywhere. It’s a great resource for ideas all over the world! Erin: Congrats on a truly awesome summer of high route accomplishments! Thankful to be along in spirit. Looking forward to the next time you hit the trail and of course to your adventures in The Land of the Kiwis. Having followed Nancy’s hike there, it will be fun to follow yours. I’m pretty excited about that one. The TA itself requires going in with the right expectation as it has a wide spectrum of experiences. I am looking forward to an open ended hike and using the trail to guide me south as I jump off from time to time to hit the awesome side trips along the way and then return to continue south. It will be different and fun to have a freestyle kind of hike. Seemed like Nancy’s least favorite parts were when she had to take roads, but also seemed like there were so many people who were welcoming and you will see plenty of spectacular scenery and sheep ?? My Kiwi friends are the best, mostly around Christchurch, but they said they felt at home when visiting Orcas Island area. Amazing how much fun it can be, watching someone else do all the hard work..
Oh cool! I did write the warning that it has a lot of elevation ups/downs and we did quite an aggressive itinerary, but there are ways to do it and break it up and resupply. I like that it’s “shorter” so there is some wiggle room in there with breaking it up. A warning to do it late summer. We were a bit early and were fortunate nothing stopped us. The two main things are King Col (day 6) cornice and Simpson Meadow crossing (Day 10). I agree with Jerry, it’s much easier here in internetland! Thanks for sharing everything. It helps me a bit with my confidence as well. Who knows what I may try as I continue on my trail of evolution to get better and stronger. I really like the photo of your victory meal. Just a potato and a big piece of steak. Now that is a celebration! Now we celebrate you as you go on to trails on continents where visa’s are required! Hope you have the time of your life! And the essential chocolate milk of course! There are just some things that are non-negotiable! Very well done. I enjoyed it very much thanks. Thanks for your great descriptions and your photography is awesome as usual. Enjoy Mt. Rainier. I understand Wonderland has 22,000 feet of elevation gain. You should love it. Erin: thanks for letting all of us follow your adventures this summer. It was great to meet you in Mammoth. Kathryn and I are up near Seattle right now. I’m not sure if you’re up here now but I’ll look for you on the Wonderland Trail as I fly home today. You and the other ladies have inspired me so much and made me believe that it’s possible to get out and enjoy these backpacking adventures. While I hike, I haven’t backpacked in more than 30 years. I’m changing my entire lifestyle to be able to make backpacking a regular part of my life. I love following your adventures! Aw! That’s awesome to hear Vicky! You’ll love it. Erin, your summer has really sounded magical so far. It has been a great read. Your summary of the consecutive high routes was excellent with notes on the routes, the guides, the effort entailed and the results you achieved in terms of skills and confidence gained. I love how you express the joy and sense of accomplishment of meeting the challenges and the incredible beauty wilderness provides. Your sense of humor and gratitude make reading your blog very special. Charge on! Just trying to catch up with you after spending a week hiking in the Sierra with my daughter. We pushed it 19 miles the last day to get to our car for a baked potato. Reading how you savored the last day by staying one last night almost has me wishing we stayed another night, but then the baked potato was really good. Thanks again Erin for your incredible blogging and keep on hiking your own hike..
Yeah, there are some days where I’d have rushed out as well. E is pretty good at prioritizing the experience out there and I really appreciate that influence she can have over me to savor it a bit. Congrats on another amazing trail! I love these shorter routes you are doing this summer. I’m really looking forward to the next one — hope it works out! Congratulations on three great off-trail hikes. I know looking at other photos of King Col that give a better sense of just how steep it is that I would never be able to do what you did, or at least would never want to do it again. I have also spent some time fighting my way through thick brush in a burn area, and between the downed trees, the stinging nettles, and the thorns, it was the most difficult hiking that I have ever done. 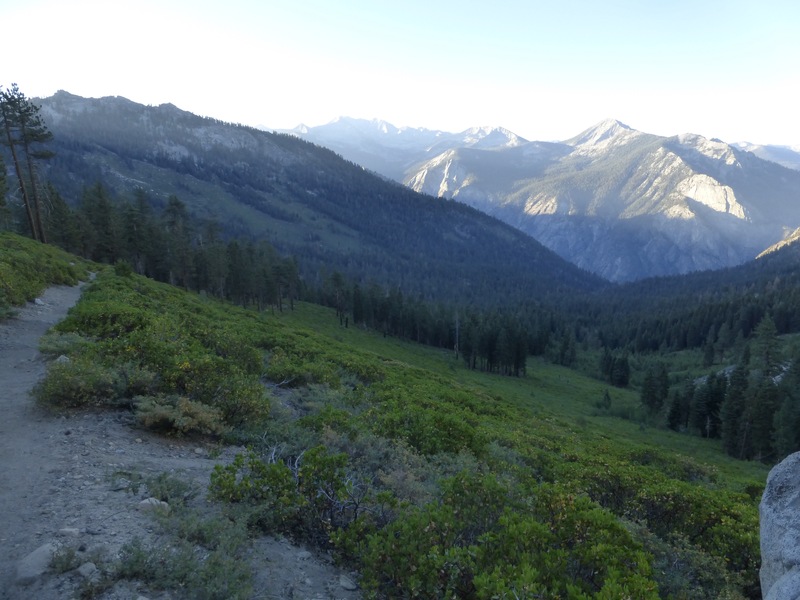 If it is possible to set aside your growing confidence level with off-trail travel, which is more technically difficult, the Sierra High Route or the Kings Canyon High Basin Route? 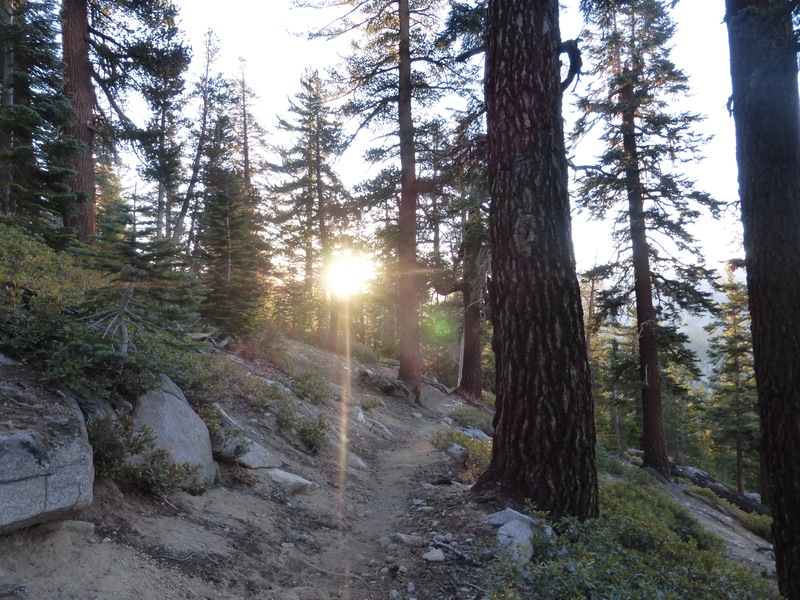 I love hiking in the Sierra and have a couple of off-trail trip plans, but I am also interested in these two off-trail routes developed by well own hikers/climbers. Second, it looks like one of you was using a BV450, the smaller bear vault. Did you find that you were able to fit 7+ days of food in the BV450? 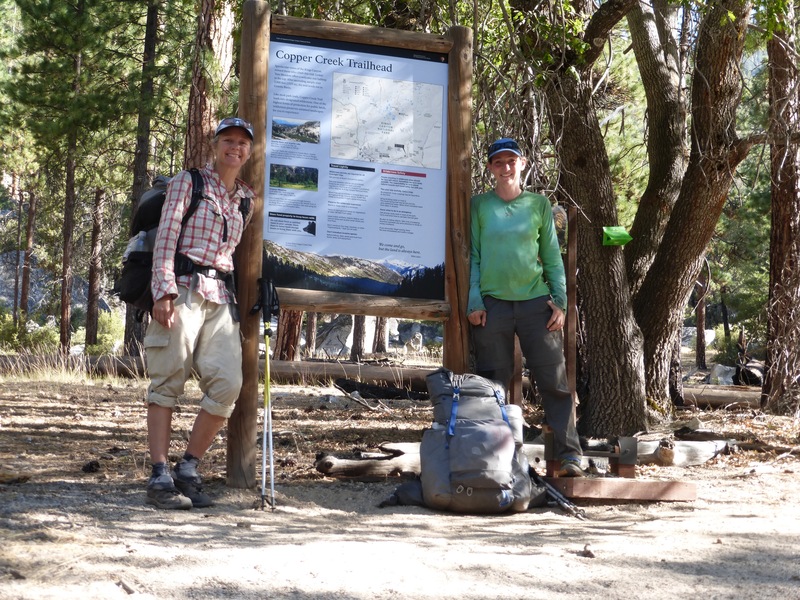 I used one for 6 full days and 2 partial days this summer in the Sierra, but that was on-trail travel, which would seem to be much less taxing on the body with lower food requirements. Thanks, and keep enjoying the outdoors. Good question. I’m sure they are both quite similar. The problem is that I did the SHR in a good deal of snow and it was my first experience with this kind of travel, so I felt that it was much more technical. Hard to view it more objectively, but I did find the KCHBR to be much more relaxed IMO with more enjoyable downtime between passes and less endless talus that is found on the SHR. As for the bear vault, I had planned to bring the bigger one and had a shipping issue in Mammoth so it didn’t arrive and I had to buy one and chose the small one since I didn’t have one of those. Really, there were only a couple spots where it was really required and I had the UrSack (technically not approved) along with that for the other food.